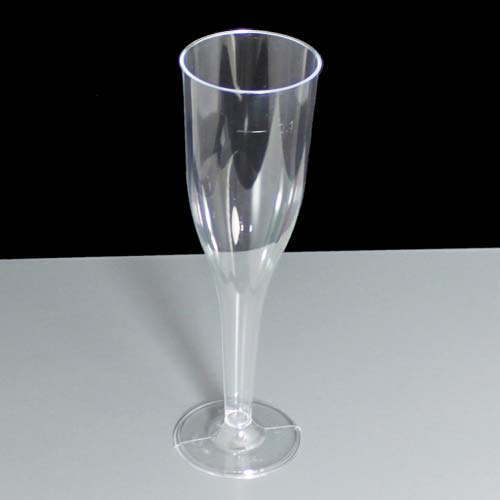 The 1470 single piece clear disposable polystyrene champagne flutes have a 135ml (4.8fl.oz) approximate capacity to the rim with an embossed line at 100ml. 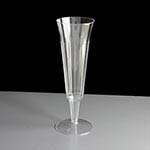 They are manufactured in Denmark by Facet and are sturdy to hold at the stem but flimsier at the top, but are perfect as a single use flute for serving Champagne, Prosecco or other bubbles in a busy environment where normal glass isn't suitable. The flute has a number of markings, the main one being an embossed line on the inside at 100ml with 0.1 beside a line. The base has the markings of the manufacturer, food grade material logo, Recycle 6 logo and the product code 1470-1. We sell this flute by the shrink wrapped sleeve of 10, case of 100 or by the pallet (click bulk pricing tab below for volume pricing information). These champagne flutes are marketed as disposable, but as they are made from Polystyrene they can be widely recycled after any event. 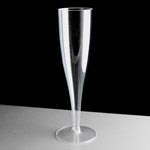 We have a wide range of customers who purchase these and our other plastic champagne flutes, normally for use at functions such as weddings, parties, festivals, one off celebrations as well as in licensed bars, clubs and restaurants. they are a cost effective choice for one off events. 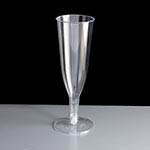 Feedback for Disposable 135ml Champagne Glass - Required: Box of 100 has been compiled from 0 reviews.